Considered to be one of the greatest playwrights of the Victorian era, and legendary for his wit, flamboyance and flair for the dramatic, Oscar Wilde would feel right at home in this richly decorated salon. 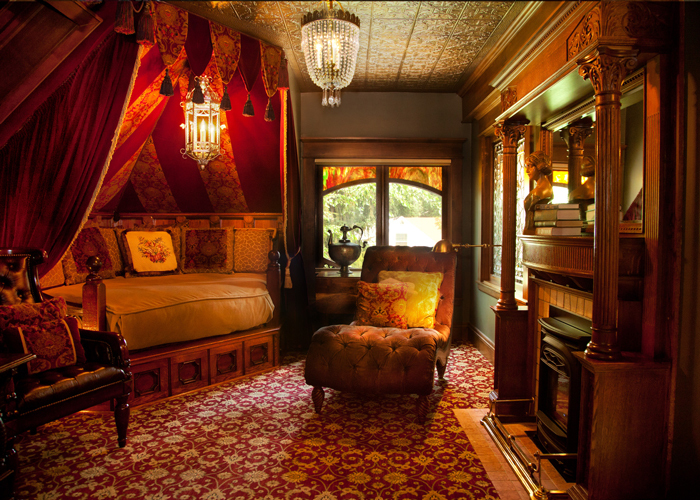 The handsome sleeping chamber features a pentagonal bed draped in posh fabrics, tufted leather furniture, stained glass windows, and an ornate Victorian fireplace. Antique French doors lead into an enormous bath where guests will luxuriate in an ultimate spa experience. Elegantly tiled in Italian Travertine marble, the bath features antique crystal chandeliers, a private water closet, a cushioned window seat, and a large walk–in steam shower with an overhead rainfall shower and built in benches large enough for lounging. Marble columns flank a deep, step-up jetted tub where guests can sip champagne and choose between star gazing through a skylight and watching the flames dance in the spa's separate fireplace.